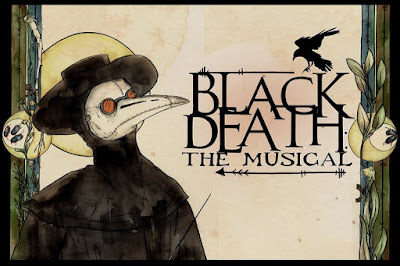 Just in time for Halloween, Apostasia Productions presents Black Death: The Musical at the Sabes JCC in St. Louis Park, for just three performances, October 28-30. Playwright and lyricist Susan Woehrle has combined the historic spread of bubonic plague in Europe with the modern twist of reanimating the dead. Black Plague Zombies! Scott Keever has also brought together diverse influences to his musical score, which is described as "14th-16th century vocal music combined with the songwriting style of Tom Waits and Nick Cave." It's hard to imagine what that will sound like, but the styles combine surprisingly well. The talented cast sings medieval-style melodies accompanied by keyboard, drums, electric guitar, and bass. As you may have guessed, this is not a story told with a straight face. Much of the humor comes from references to actual circumstances surrounding the plague, while telling the story of a few people whose paths intersect as they deal with the pandemic. A doctor desperate to convince people that cleanliness is essential to stopping the disease pleads with the Pope to encourage bathing while an alchemist experiments in restoring life to dead creatures and a pair of nuns arrive to help care for plague patients. Rob Ward is very watchable as the plague doctor, even when wearing the historically-based mask of his profession. Roni Page and Sommer Walters display great vocal range as two of the nuns. The standout in the cast is Rodolfo Nieto, whose bass-baritone voice sounds great both singing and speaking, and who has wonderful comic timing. Some of the lyrics are hard to understand over the band, but the ones I could hear were quite funny. The production is simple, with just a few pieces of furniture on a black stage, but that keeps the focus on the music. If the idea of a musical about the Black Death sounds like fun to you, it's definitely worth checking out. It still feels a bit like the Fringe show it began as, but is not like any other show I've seen. For more background on the production, check out this Q & A that Kendra Plant did with writer Susan Woehrle for Artfully Engaging.